Houston, Nov. 2, 2017 - A new restaurant with a familiar name has opened on the University of Houston campus. 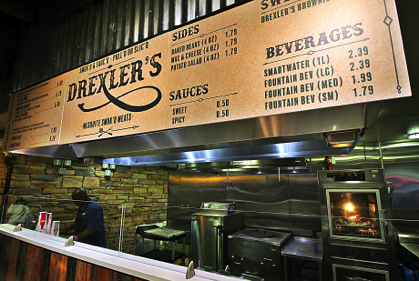 Drexler's is located in the Student Center Satellite food court area, in the space formerly occupied by Burger Studio. NBA Hall of Famer Clyde Drexler is an alumnus of UH. The barbecue restaurant which bears his family name serves a range of mesquite smoked meats, from pulled pork and pulled chicken to brisket and sausage. Sides include baked beans, mac and cheese, and potato salad. For dessert, they have brownies. "The University of Houston community can now get great quality barbecue without having to leave campus," said UH Dining District Manager David Riddle. "We're happy to be able to fill this niche and hope students, faculty and staff enjoy having it." UH Dining will be adding Drexler's to the Boost mobile ordering app in the spring semester, allowing guests to save time and skip lines during busy periods. The restaurant is open Monday through Friday from 10:30 a.m. to 3:30 p.m. The University of Houston is a Carnegie-designated Tier One public research university recognized by The Princeton Review as one of the nation's best colleges for undergraduate education. UH serves the globally competitive Houston and Gulf Coast Region by providing world-class faculty, experiential learning and strategic industry partnerships. Located in the nation's fourth-largest city, UH serves nearly 44,000 students in the most ethnically and culturally diverse region in the country.